We are currently in a world surrounded by uncertainty; Brexit, diesel cars, flexi-leases, will Robbie re-join Take That (again!) Because of this, we have two types of people to cater for: The “take my money I don’t care” society and the “I’m spending nothing until I know what’s going on” culture. While businesses try to survive the latest wave of nobody in charge really knowing what is happening at the moment, we have been clearing away the fog of chance for those that we speak to and I believe that’s all we can do. What if you can buy a car, confident of what you may owe or what it will be worth at any time? Knowing that you are paying enough to avoid negative equity and, whatever happens, professionals have the proper tools in place to protect you from most things out of your control. AND what if you can still have fun buying it today? Car Sales businesses are, of course, taking advantage of the two groups I speak of. Some clients are wealthy enough to just want the product now, regardless. They will buy from the wrong people and take little (if any) advice from get-rich-quick hopefuls, just because they want to be seen buying “that car from that company”. Well that car is going to depreciate by £40,000 this year because of a facelift, the airfix bodykit that’s on it and that company’s ridiculous profit margin. The “experts” around you don’t need to care what happens in the future nor even have the wheel nuts to suggest that you might wait. This is brilliant news for the vultures, swooping for easy pickings. As for the group that won’t spend until they absolutely, positively know everything they need to know; who can blame them? It just means taking the time to advise, reassure and sometimes suggest that they are right. Much like the socialites that are Pied Piper’d into spending willy nilly, the less confident buyers are being fed some of the right information, but (as the late Eric Morecambe put it) not necessarily in the right order. Who knows where diesel is really going? What effect will Brexit really have on us all? Is it better to lease a car, buy a car, finance it or just hold on? Nobody knows… really, they don’t. But we need to stop buyers being baffled by terminological inexactitude and handing money over to people who are feeding their own greed. Have someone work with you to establish whether you really are getting the best deal. I have spent my entire working life with cars and finance, shooing vultures away and fighting the paper-thin veil between what sounds good and what truly is the best advice for car buyers. Where will you be in 6, 12, 24 months’ time? What if your circumstances change? What if you are not well off for ever… or hopefully the other way around, when you can finally have your dream car? 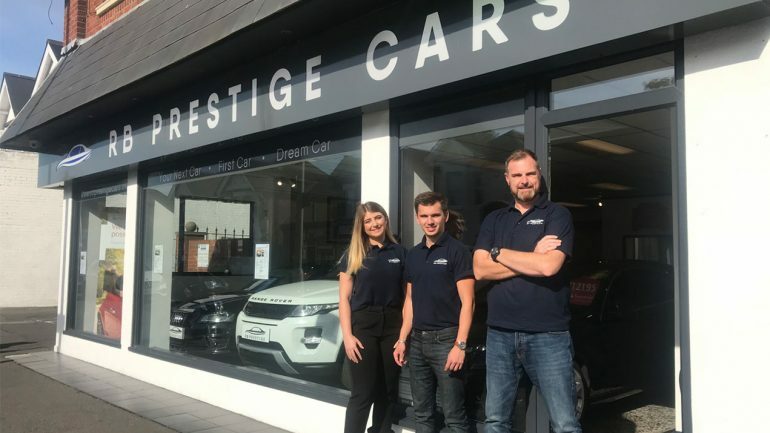 Let RB Prestige help light the way ahead for you and, whatever route you choose, ensure that you will be in a much better place when you decide to change your car, both now and in the future. With our Prestige for All outlook… it’s not about the price tag; we give you reason to just stop for a minute and smile. Come and see the team for a coffee on Ashley Road in Poole, or call Rob on 01202 878188 anytime!